Kanpur: Dawn had not yet broken when protesters started arriving by foot, cycle rickshaws, cars and buses — drawn by Baba Ramdev, their yoga master who said he is launching a “national" agitation on Thursday to protect the sacred Ganga and declare it a national heritage. Throngs around the spiritual leader are not uncommon, but his trademark yoga and pranayam session was punctuated by politics this time, along with devotional songs for the Ganga and emotional speeches on its importance. “If the Taj can be protected because it is the artistic heritage of the country, the Ganga must also be protected for it is the living heritage of the country," said Ramdev. Citing human waste, sewage and animal remains dumped in the river, he gave the government one month to declare the Ganga a national heritage and warned: “If this is not done, I will have to return not to hold a yoga camp, but to wreak havoc." Ramdev is among several religious leaders, including Sri Sri Ravi Shankar of the Art of Living Foundation, who have joined forces with Hindu groups to call attention to environmental causes. Some observers note the timing — before some key state as well as impending national elections — and say it could boost the Bharatiya Janata Party (BJP) as the leaders havea large following among moderate Hindus. Ramdev said he chose to launch his agitation in Kanpur because it has a reputation for being the worst offender. The city has a tanning industry that by one government official’s estimate generates Rs2,000 crore in annual sales and whose owners try to escape responsibility for treating the waste they create, says district magistrate Anil Kumar Sagar. Sagar notes that these tanneries are supposed to run treatment plants but “they did not start doing this until we threatened to close down their factories". But closing factories is not really an option because of the thousands of city residents who are employed there. This is by no means the first effort to clean up the river. In 1985, then prime minister Rajiv Gandhi launched the Ganga Action Plan to clean the river, but the programme didn’t achieve much. In Kanpur, on the raised stage, typical sadhus and sadhvis were joined by politicians, both local and national figures, all eager to be seen by part of Ramdev’s agitation. Minister of state for home Shriprakash Jaiswal, who was sent to Parliament by Kanpur voters, reiterated his love for the river and assured the public: “Of course, the Ganga is a national heritage. What you are demanding is merely a technicality. I will speak with the Prime Minister in Delhi and I have no doubt that it will be done." Kanpur’s mayor also announced a sewage treatment programme and a Rs60 lakh plan to beautify Sarsaiya ghat, one of the city’s oldest ghats. Other local politicians, such as Satish Mahna from the BJP and Ajay Singh Munna from the Congress party, have conducted a longer campaign in the city to be seen as allies of Ramdev. 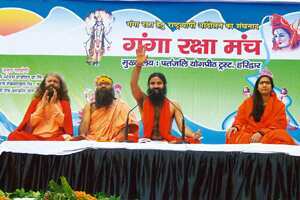 Billboards on major city roads, with their photographs prominently displayed, asked residents to attend Ramdev’s rally. This campaign appears different from those led by the Rashtriya Swayamsevak Sangh or its ideological counterpart, the Vishwa Hindu Parishad, which typically rest on religious sentiments. Some observers say the latest effort seems to suggest the emergence of a religious non-governmental organization, which lobbies for broader civil society causes. Some others say it is all just a political stunt. Meanwhile, speakers at the rally fired up the crowds. “What will a mother not do to save a sick child? What has this river not done for us? Now she needs us. Will we answer our mother’s call?" demanded Sadhvi Pooja Ritambhara, founder of a chain of homes for abandoned women and young children, and a Hindu leader who played an active part in the Ram Janmabhoomi campaign of the early 1990s that ended with the destruction of the Babri Masjid at Ayodhya. Follow Ramdev’s lead, she said. “For, I know you have lost faith in the political leaders," she said to cheering crowds. “It is in times like this that saints have to give direction and inspiration to the people of country."